The Dodgers only need one more win to clinch the NL pennant and advance to a World Series showdown against the Red Sox, but they might not get that chance tonight. Following David Freese's leadoff home run off of Milwaukee left-hander Wade Miley, the Brewers erupted for four runs in the bottom of the first inning to take the lead. In his second start of the NLCS, Dodgers' southpaw Hyun-Jin Ryu had a two-on, two-out situation when Jesus Aguilar came up to the plate in the first inning. 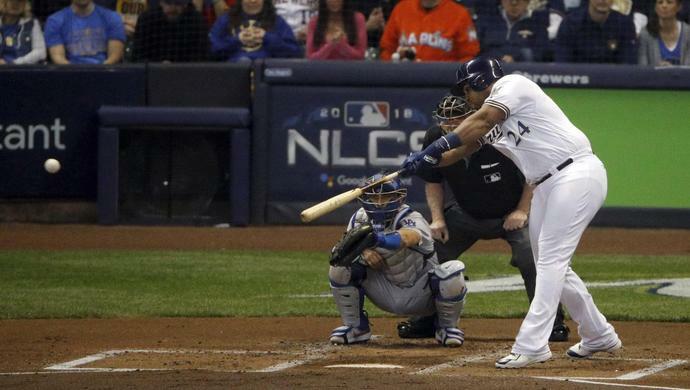 Aguilar worked a 2-1 count against Ryu, then lashed a two-run line drive double to right field, bringing both Lorenzo Cain and Ryan Braun home to score. In the next at-bat, Mike Moustakas drove in Aguilar with a first-pitch double to right, while Erik Kratz's RBI single topped off the Brewers' four-run spread to give them an early 4-1 advantage. Ryu didn't get a reprieve for long. In the second, Christian Yelich and Braun went back-to-back with another pair of doubles to advance the Brewers 5-1 above their National League rivals. The lefty was pulled after just three innings of seven-hit, five-run, three-strikeout ball - per MLB.com's Bill Shaikin, it marked just the second time the 31-year-old had given up four or more runs in a start this season. The Dodgers started to work their way back in the fifth inning: Freese returned with an RBI double that plated Brian Dozier, who scooted around from first and easily beat the tag at the plate to score the Dodgers' second run of the night. Together, the teams have combined for five doubles in five innings. The Brewers still lead in the fifth, 5-2. ST. PETERBURG, Fla. (AP) -- The Boston Red Sox have traded catcher Blake Swihart to the Arizona Diamondbacks along international bonus pool space for minor league outfielder Marcus Wilson.